Students can now join Splashtop Classroom screen sharing sessions and collaborate with lesson content from their iPhones! The Splashtop Classroom for iPhone app is now available in the iTunes store! This free app makes it possible for students to join a teacher’s screen sharing session from their iPhones. This latest release expands Splashtop Classroom’s broad device support, which now includes Windows, Mac, iOS, Android, and Chrome web browsers. 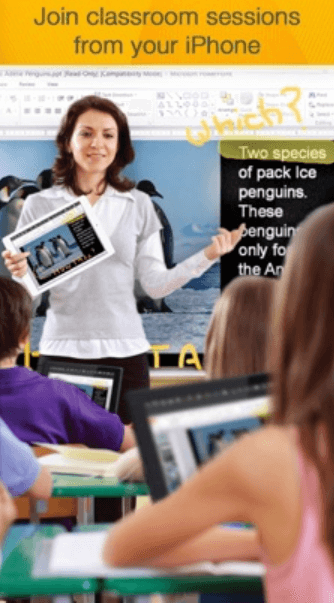 Splashtop Classroom is a remote control and screen sharing solution for teachers and students alike that enables greater classroom engagement. Teachers are able to connect and control the class Windows/Mac computer from an iPad or Android device. This allows the teacher to get out from behind the desk and engage the entire room while still being in control of the class computer. Teachers can also share the class computer screen (with audio) to every student’s iPad, Chromebook, PC, Mac, and now iPhone device. This improves student engagement and interactivity. Students can then view, control and annotate over lesson content directly from their own device. With the new Splashtop Classroom for iPhone app, students with iPhones are able to join the teacher’s screen sharing session with a unique code or by scanning a QR code that the teacher can display on their screen. Once connected, students will be able to see the teachers screen in real-time on their iPhones. Teachers can then give control to a student so they can present and even annotate over lesson content. Splashtop Classroom is perfect for 1:1 and bring-your-own-device (BYOD) initiatives! Teachers can pass control to students and let them explore and communicate their ideas with the rest of the class without moving from their seats. Even the most demanding multi-media applications can be shared instantly and with a great user experience. If you’re already a Splashtop Classroom user, head to the iTunes store to download the Splashtop Classroom app now! Splashtop Classroom is a great solution for school districts, teachers, universities, and business organizations. You can get started right now with a free trial. No credit card or commitment required.